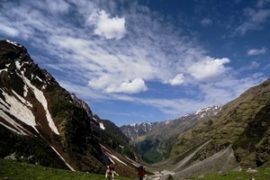 Sahastra Tal trek trail (also called as Sahasra Tal/Shastru Tal) is described as “Lake district of Garhwal by famous Himalayan travelogue writer Bill Aitken. 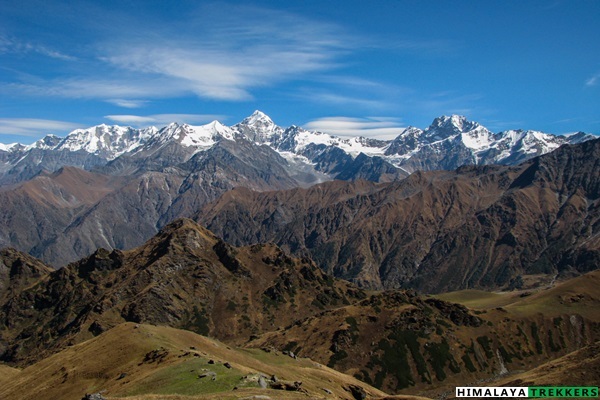 This wide spread valley is situated between Bhagirathi valley in the west and Bhilangana valley in the east. 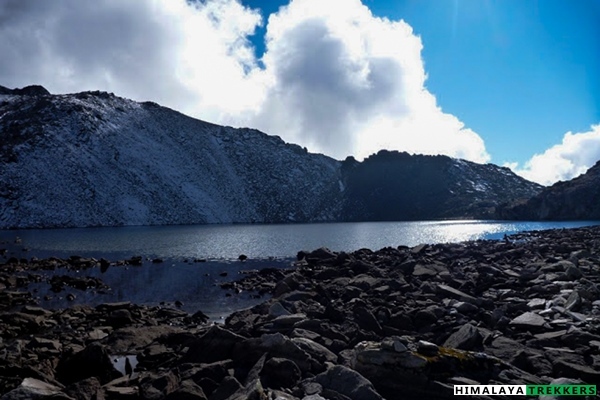 From Kush Kalyan plateau a high ridge continues towards north and several high altitude small and medium lakes are found on both side of the ridge. 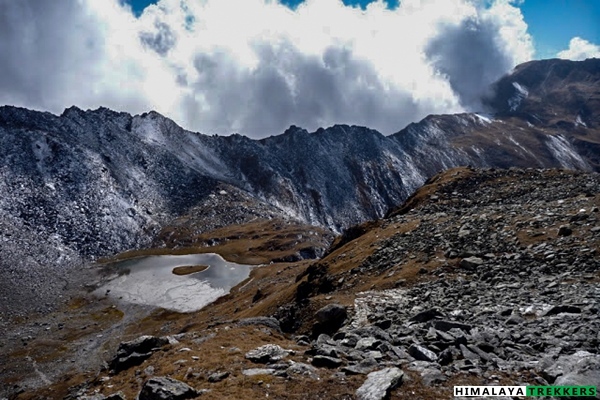 Sahastra Tal ( also referred as Shastru Tal) is situated at the head of this ridge. According to legend a king performed a ritual on the shores of this lake by offering a thousand (Sahastra) Brahma Kamal flowers to Lord Vishnu. 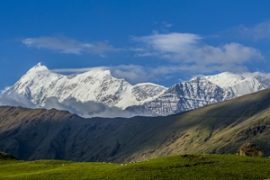 This less frequented trail offers grazing pastures, lush green alpine meadows (Bugyal), High Himalayan ranges and peaks including Bandarpunch, Black Peak/Kalanag, Jaonli, Srikanth, Draupadi Ka Danda along with Gangotri range. 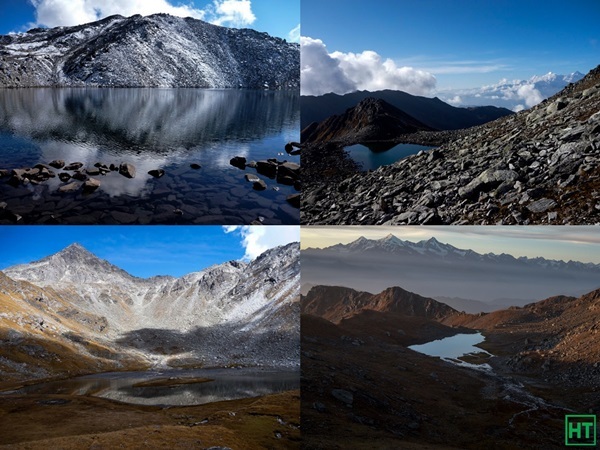 Another major highlight is the high altitude lakes of varying size and depth. 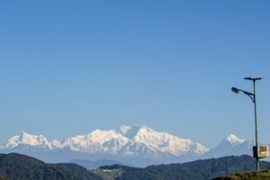 The walk over far flung alpine meadows of Kush Kalyan and Kyarki Bugyal is a delight to any trekker. 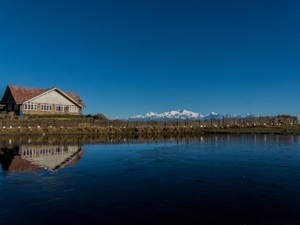 The panorama of Western Garhwal range awaits at Kyarki Khal. Stunning sunrise and sunset are never to forget. During monsoon the route blooms with thousands of Brahma Kamal and Fen Kamal. 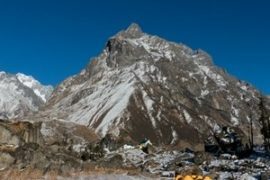 In simple words this “All-In-One” trail is a must do trek for any hiker who wants to avoid rush while not missing any aspect of a classy Himalayan trail. Day 1: Drive from Dehradun to Bhatwari – 175 Km – 8/9 hours. 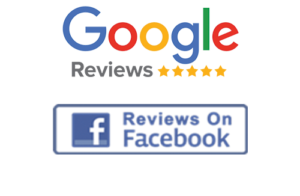 We may arrange a pickup and drop from Dehradun to Bhatwari and return. This will be shared by the team members on actual basis. A Tata Sumo/Mahindra Maxx takes Rs 5000 for Bhatwari pick up and Rs 4000 from Ghansali to Haridwar drop. You pay directly to the driver. 1) You will get morning bus to Uttarkashi both from Dehradun and Haridwar. These will leave latest by 7 am. It will take around 7/8 hours to reach Uttarkashi. From here you will get a shared Jeep to Bhatwari which is 30 Km up, on the Gangotri road. 2) Take a shared Jeep to Uttarkashi from Rishmina Pul (bridge), Dehradun. You will get vehicles in the morning. 3) While returning from Ghansali there are direct busses for Rishikesh/Haridwar in the morning. 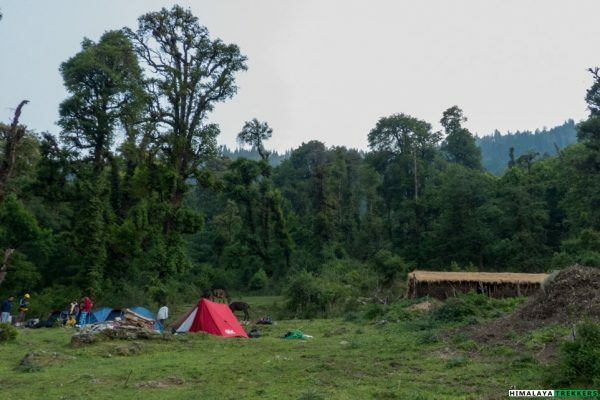 Duration: 7 days of trekking; Dehradun to Dehradun in 9 days. 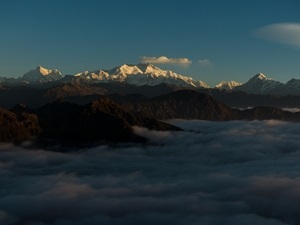 Prerequisite: Prior high altitude trekking experience along with good physical fitness. 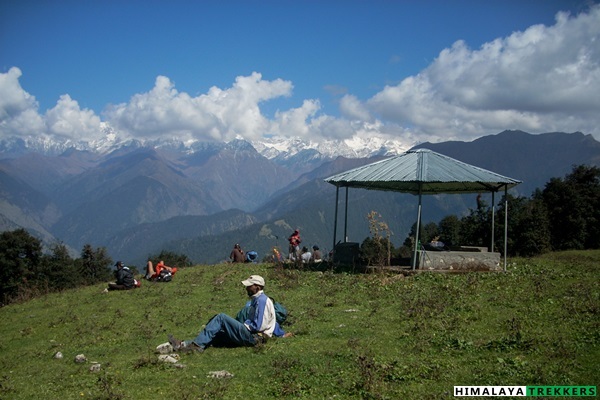 Access: Trek starting point (trek base) is Bhatwari, 220 Km from Haridwar. Access to Bhatwari (The trek base): We will arrange a pickup and drop from Haridwar to Bhatwari and back from Ghansali to Haridwar. This will be shared by the team members on actual basis. A Ta ta Sumo/Mahindra Maxx takes Rs 5000 for Bhatwari pick up and Rs 3000 from Ghansali to Haridwar drop. 1) Reach Haridwar in the previous night and board the bus for Uttarkashi as early as you can in the morning. There are both State and Private operated bus for Uttarkashi. It will take around 8/9 hours to reach there. From here reserve a car for Bhatwari, which is another 30 Km on the Gangotri highway. If you reach Uttarkashi by noon , you may be able to get the bus which operates between Uttarkashi and Gangotri. 2) From Ghansali there are buses for Rishikesh/Haridwar. Today morning we start our trip from Haridwar. Pickup in the morning from Haridwar and reach Bhatwari (~ 1525 m, 5000 ft) via car. Distance around 220 Km and may take 10 hours. The route goes through Rishikesh, Chamba, Dharasu and then to the Uttarkashi town. From here another hour’s journey to Bhatwari, local Tehsil headquarter. Most of the journey is along the Bhagirathi River. Night stay in lodge. Our trek starts from today. At first we descend from Bhatwari to Malla along the Uttarkashi-Gangotri road for about 45 minutes. 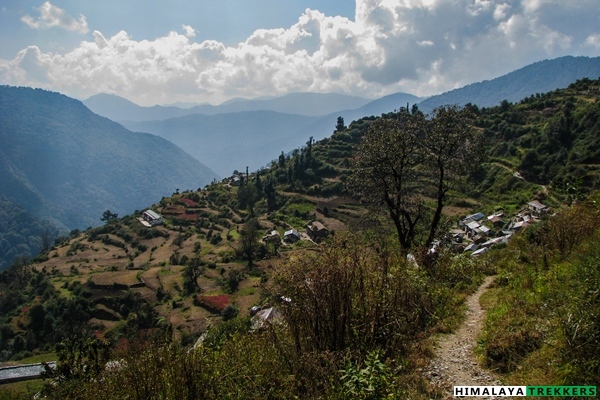 Malla is a small village and spread on the both sides of Bhagirathi. We get down to the Bhagirathi river and cross the bridge. From here a moderately broad track climbs steadily to reach the last village named Silla (~ 2000 m/6550 ft) in 3 hours. After crossing the village we continue to climb. The trail goes through the evergreen montane forest and in another 2 hours we reach a clearing inside the jungle, our camping ground called Gairi/Silla Chhanni (~ 2300 m/7550 ft). Total distance is 10 Km and can take 4/5 hours. This is the only place with water after Silla and used as cattle shelter by the villagers in summer and monsoon. We camp here for the night. Today morning our walk starts inside the jungle while climbing gradually. We continue to climb on the broad trail for an hour to reach another opening with a covered resting point. From here we get a beautiful view of the peaks towards north. After this point the trail enters into the dense forest of Oak and Fur. The climb is moderately steep from here and the track winds up on the slope. 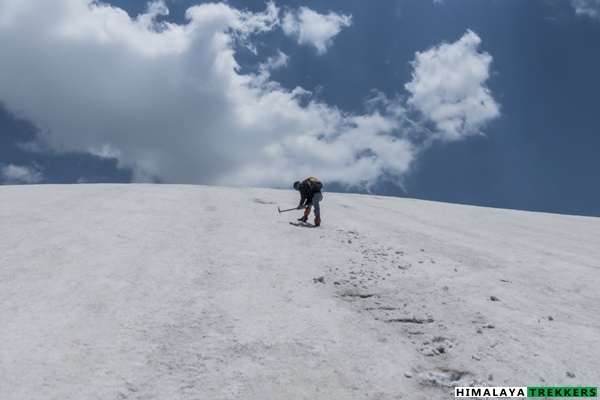 Continue climbing for another 3 hours or so to reach the base of the pass named Chuli La (~ 3500m, 11500ft). The entry to the pass is wide and tree line ends before it. There is a small peak adjacent to the pass. Crossing the pass the track zigzags slowly down to the meadows and continues steadily. On the way we see small shepherd settlements down on the left side of the track. There is no water source for a long stretch till we reach Kush Kalyan plateau (~ 3200 m/10500 ft). 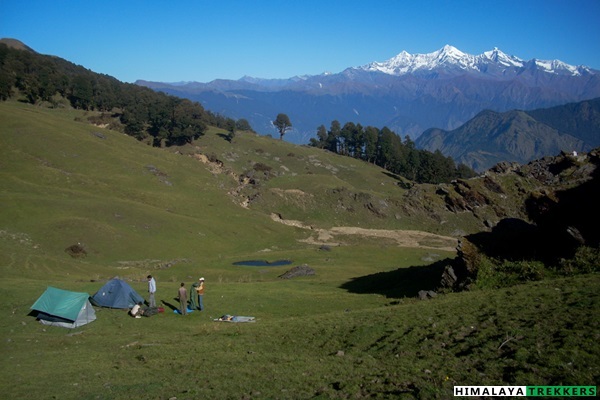 This is a splendid lush green camping ground with magnificent view of the Himalaya. 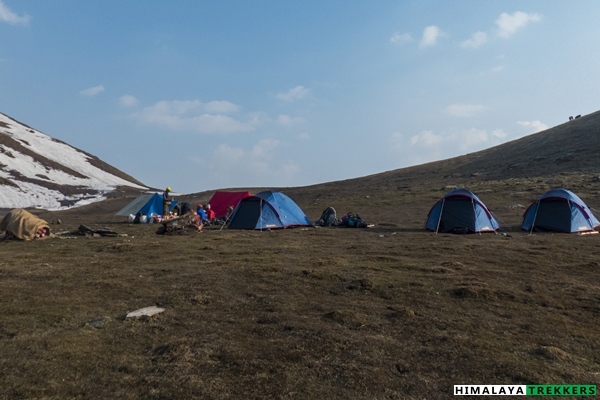 The Kush Kalyan top is just beside the camping ground around ~400 m/1300 ft above with a pointed pinnacle. Distance is 12 Km and may take 6/7 hours. This plateau has few trees and bushes scattered around and marks the end of treeline. We camp here for the day. 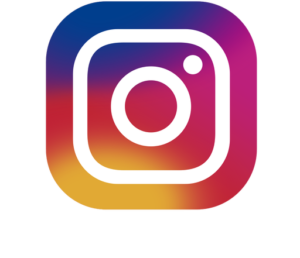 Trek to Kyarki Bugyal – 12 Km – 5/6 hours. Today we take a left and gradually walk on the trail which goes through the top of a grass slope. Tree-line recedes and as we continue on the meadow of Kush Kalyan. 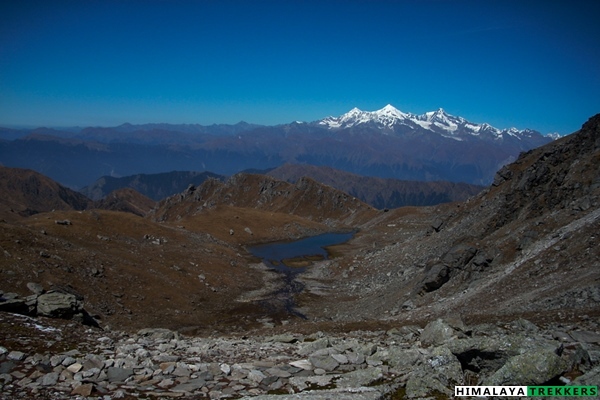 We descend to a saddle and then gradually climb along a ridge to reach Bhowani Bugyal. From here the climb is steep for about 2 hours till we reach Kyarki Khal (~ 4000 m,/13100 ft). The view of the surrounding is stunning from this high point. After crossing the pass we gradually descend ~ 300 m/1000 ft to reach the camping ground of Kyarki Bugyal (~ 3700 m/ 12100 ft). There is a small stream flowing by the campsite. Distance is 12 Km and can take 6/7 hours. We pitch tents for the night. 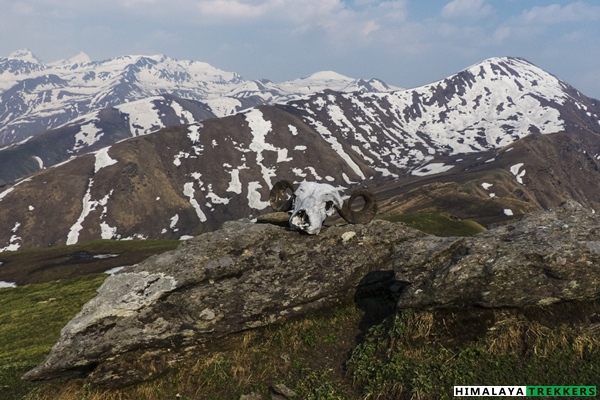 Trek to Lamb Tal – 6 Km – 3/4 hours. A relatively small day of trek starts with a steep climb on the grassy slope just above the Kyarki campsite. The trail climbs further onto a ridge from Kyarki plateau. The views are mesmerising as Bandarpunch range Jaonli and Srikanth peaks form the backdrop to the north. In summer during June expect snow starting from this area and ahead. In monsoon this slope is full of wildflowers. We continue to traverse the ridge and encircle it to get into another ridge.From here we climb zigzag on the trail and later the track widens and almost on a level ground for a while. This track is known as “Chhe Phuti Path (The six foot wide path) and was constructed during the British rule. After walking another half an hour we can see small to medium size lakes formed down on the left of the track. 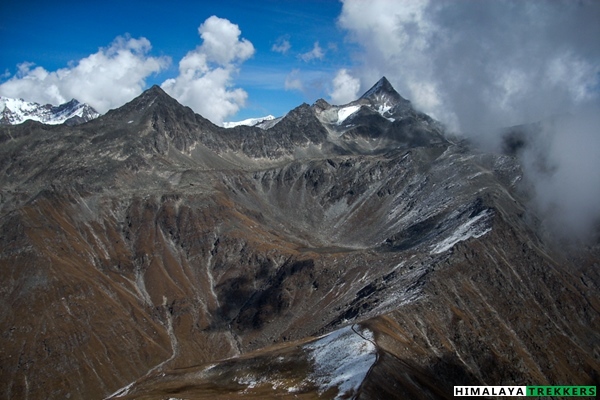 First we see Kokuli Tal and then reach the camping ground of Lamb Tal (~4300 m/ 14100 ft). Distance is 6 Km and can take up to 4 hours. During monsoon Brahma Kamal and Fen Kamal flowers grow in abundance. There is also a small peak above Lamb Tal. 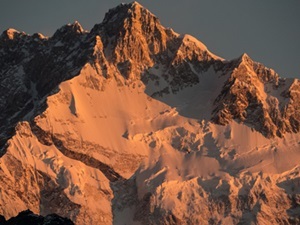 One can scramble up to the top to get a magnificent view of Sahastra Tal and peak. Camp overnight. Trek to Sahastra Tal and back – 12 Km – 7/8 hrs. Today is a relatively challenging day that we climb up to Sahastra Tal (~ 5000 m/16400 ft) and back to the same camp. We start with a zigzag climb to the ridge on the broad track. The climb is gentle at the beginning and then moderate on rocky terrain. In summer the terrain is covered with snow and be prepared to trudge long. 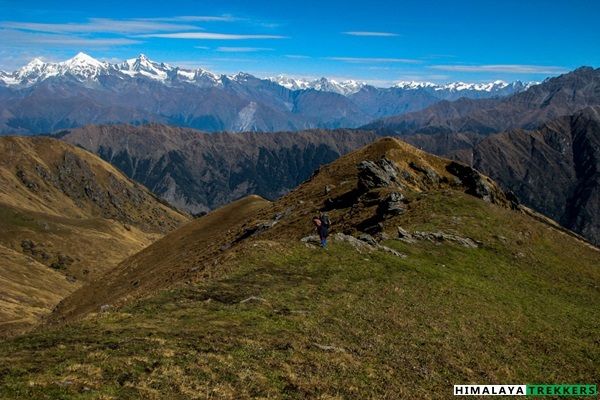 The ridge is called Kokuli Dhar and view are fantastic from top. It is about an hour’s climb to the top of the ridge. We can see the Sahastra peak straight ahead. Often this point gets covered with clouds and it is difficult then to find anything ahead! 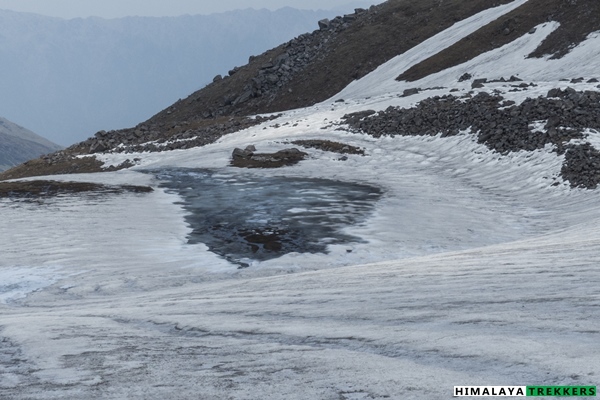 From here we gradually go down and walk on almost level ground to reach the next lake called Dodhi Tal. This is a medium size circular shaped lake with a perimeter about a kilometre. From here we slowly start climbing (as the air is pretty thin) the rocky gravel trail behind the lake for an hour to reach our final destination, Sahastra Tal (~ 5000 m/16400 ft). 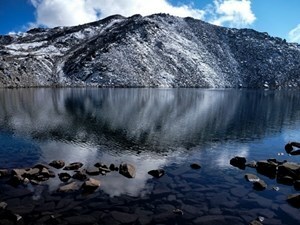 This is a fairly large lake considering the altitude and the water is crystal clear. We get a birds eye view of the valleys all around. The conical shaped Sahastra peak rises ~300 m/1000 ft above the lake to the north. After spending half an hour here we descend to Dodhi Tal and then tracing our track back to the campsite. Total distance is 12 Km (one side is 6 Km) and may take 7/8 hours. Tent overnight. 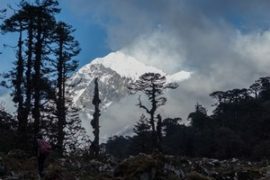 Today we retrace the path through Kyarki Bugyal to Kyarki Khal and finally to Kush Kalyan plateau. Distance is 18 Km and may take 7/8 hours. From Kush Kalyan we take a different trail than the one we used while coming. We descend through the opposite side while walking on the meadows at the beginning and then entering into the thick forest of conifers. On our way we cross the first village on the trail called Pinswar. This is relatively a large village with a nice Forest Bungalow. Further down we reach a point till where the car comes. Distance is 10 Km and may take 5/6 hours. There is a shop and tea stall. From this point we take the car and reach Ghansali via Budhakedar. 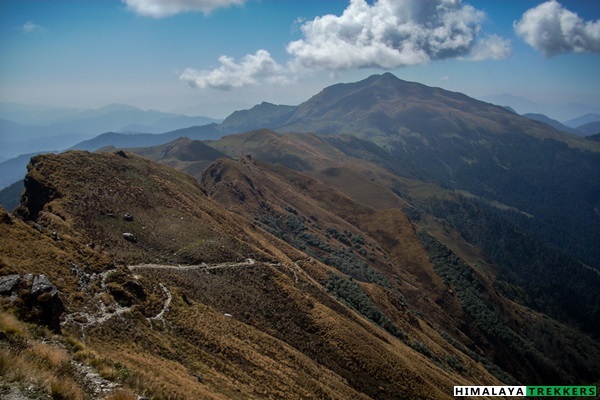 Car takes 3 hours to reach Ghansali which is a congested typical Himalayan low altitude town. There are several hotels and restaurants ranging from budget to standard. Night stay in lodge. Take the car in the morning for Haridwar and drive via Tehri Dam. Distance is 150 Km and should take around 6 hours. 2 night’s accommodation at Bhatwari (Day 1) & Ghansali (Day 8) in lodge on sharing basis and dinner.